Zionist Organization of America applauds the 14 senators who wrote a letter to Obama, urging him to withdraw Hagel nomination. 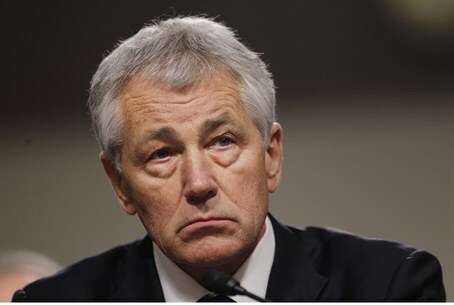 The Zionist Organization of America (ZOA) has applauded the 14 senators who wrote a letter to President Barack Obama on Friday, urging him to withdraw the nomination of former senator Chuck Hagel for the post of Defense Secretary. “If Senator Hagel becomes Secretary of Defense, the military option will have near zero credibility. This sends a dangerous message to the regime in Tehran, as it seeks to obtain the means necessary to harm both the United States and Israel,” they added. "We have concluded that Senator Hagel is not the right candidate to hold the office of Secretary of Defense, and we respectfully request that you withdraw his nomination." A new poll, recently conducted by Rasmussen Reports, showed that, in contrast to the 38 percent of Americans who oppose Hagel’s nomination, only 28 percent held a favorable view of the former Nebraska senator, while over one-third of Americans, 35 percent, believed that they lack sufficient knowledge to render an opinion. "This poll, even allowing for the fact that one-third of respondents admit that they have insufficient knowledge on which to form an opinion, shows clearly enough that a large proportion of Americans are concerned about Chuck Hagel's qualifications, competence and policy positions,” said National President of the Zionist Organization of America (ZOA) Morton Klein. "This is not only because of his disastrous views against sanctions and possible military action against Iran; his call for negotiations with terror groups Hamas and Hizballah, his views that the U.S. is the world's bully; his statement that Israel has committed war crimes and a 'sickening slaughter' against Arabs, is 'risking becoming an apartheid state', that Israel has control over the State Department, and the 'Jewish Lobby' causes Congress to do stupid things, but also because his performance at his confirmation hearings clearly showed someone who was incoherent, contradictory and mistaken on major issues of policy,” said Klein.